Bookings, bookings, who's got the bookings? When I first joined Close to my Heart, I thought I would have tons of customers, tons of bookings, and tons of downline in no time at all. But here is it a year later and I now have two 1st downline and one 2nd downline, and only a handful of customers. No bookings yet but I am going to start marketing myself big time! I am starting a card club and a layout club that will each meet once a month to work on the project of the month. The cost will be $20/month for the card club and $25/month for the layout club, both payable in advance. You are not limited to only one club, so if you like making cards as well as layouts, by all means join both clubs! The fist card club will be April 25th from 7 - 9, and the first layout club will be April 26 from 6:30 - 9. Each month, someone else will be the hostess and be able to pick the hostess rewards they would like to receive! So send me a note or give me a call to book your spot and make your payment. I will need payment by April 11 to hold your spot. Yeehaw! My Postcard Contest Entry is Done! When I received the little Stars Shine Bright postcard, I was going to throw it in the recycling. I then thought it would be a great addition to my Convention pages when I scrapped them after convention so I put it away for safe keeping. Then when we got the notice about the Postcard Contest, I was REALLY glad I had kept it! I have never entered a scrapbook contest before, but decided I am entering this one! Here is my entry. Please let me know what you think. I used the Stella paper pack, as well as White Daisy, Desert Sand, Cocoa and Lagoon cardstock. The inks are Cocoa, Sunny Yellow and Sunset, and I included various sizes of Sparkles. The brads are Pewter. ﻿The stamp set is Lovely Buckles (discontinued); the buckle is heat embossed with Silver Pearl embossing powder, which is no longer in the Idea Book, and I added a Sparkle to the middle of the star on the buckle. I asked Corp about adding pictures as I want the pics to be from convention, and was told pictures weren't necessary. I did a bit of journaling to show where it will go when I finish it off. Here's the two page spread in all its glory! Now on to making cards for swapping at convention! New Website and Newsletter! Thanks Corp! The wonderful folks at Close to my Heart Corporate office have finally launched out new websites and newsletter and they are awesome! Thank you, thank you, thank you for all the hard work in getting these done for us! Now I can concentrate on adding to my blog and not agonizing over next month's newsletter, or worrying that my website is not resulting in orders. If you have not seen the new website yet, please check it out at http://worksofheart.myctmh.com/. It is really beautiful and SO much easier to get around in. Check out the While Supplies Last in the Shop section for some fantastic deals on discontinued items. There may be something in there that you have been looking for! If you would like to book a Home Gathering, I am available most evenings as well as Saturday and Sunday afternoons. So give me a call or send an email and we can set up your Gathering in the comfort of your home! I will bring a project so everyone can try some of our great products and see first hand the quality of our paper. And think of the Hostess Rewards that could be yours! All you need is $150 in sales for the Gathering to start collecting FREE Close to my Heart select product! That's only $15 per person if you have 10 people attend! So easy to do! I look forward to chatting with you to book your Home Gathering! March really is a great month, especially if you have been thinking of joining the Close to my Heart family! 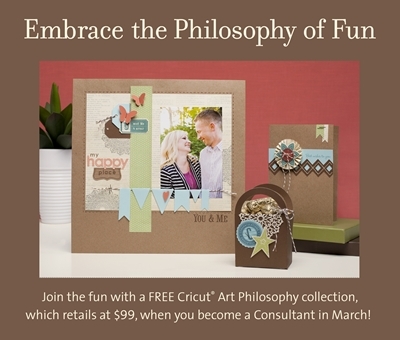 Anyone who becomes a consultant in March will not only receive their kit, but will also have their choice of the Cricut Art Philosophy collection or $100 in free product, all for the cost of the kit - $99! Think about it! For $99, you receive over $420 worth of product! How can you go wrong? Carolyn Crowe created the most amazing list of stamp sets and shared it with everyone. I have added a few missing stamps, reorganized them to make my organizing easier, and added a Category column which also heled me with my organizing (there are a LOT of blank spaces so if you have any of the stamps that don't have a category, please add it!). My version is now located in Google docs for all and sundry to use. Carolyn has a version too and hers might make more sense to you than mine. Please use whichever works best for you! And a HUGE thanks to Carolyn for her hard work in creating the original list!! You rock!